In 1990, the news on the success of IDCE in Thailand spread in Japan (newspapers/TV). The Ambassador of the Republic of Ghana to Japan, His Excellency Dr. James L.M. 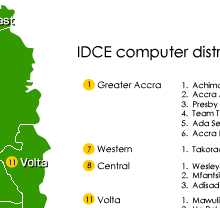 Amissah, read an IDCE article and enthusiasticly requested us to bring IDCE to Ghana. 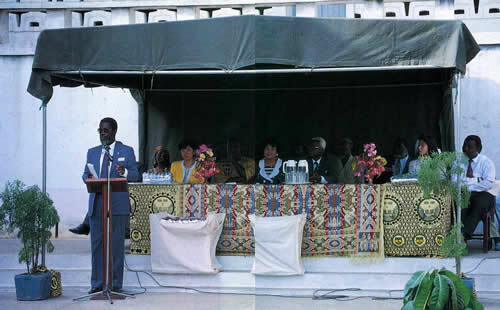 We were overwhelmingly moved by his passion for the development of his country. 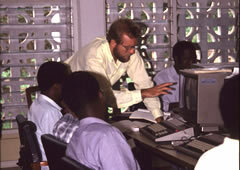 In 1991, we donated 208 sets of computers to the Ministry of Education in Ghana and offerred a 2-week seminar in Accra. Among the IDCE volunteer instructors were three MIT graduate students. 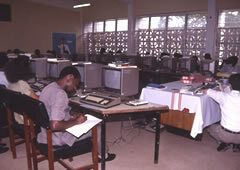 32 Ghanaian participants were teachers from institutions from 17 areas throughout Ghana (teacher-students) ; many had never touched computers before. 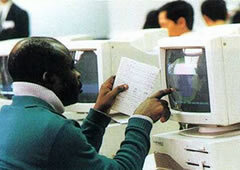 In 1992, we invited 15 teacher-students from Ghana to KCG, Japan, for more advanced computer seminar. 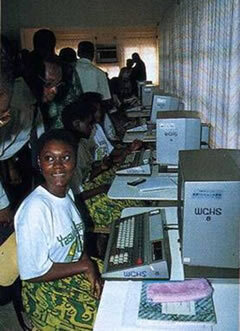 Afterwards during the year 1992, computer education began in those 17 schools around Ghana; each for the very first time in their areas. 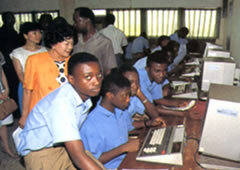 In January, 1993, the Ghana Ministries of Education and of Science & Technology opened a computer center named after Yasuko Hasegawa, the president of KCG and co-founder of IDCE. The Hasegawa family was invited as the governmental guests to attend the inauguration of the Computer Center and the celebration of the distribution of the donated computers. 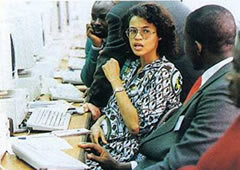 (3) IDCE’s work was a great achievement for the development of Ghana. 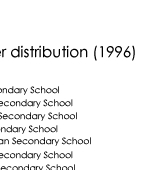 This achievement follows in the footsteps of Dr. Hideyo Noguchi, a famous Japanese bacteriologist who did much valuable research concerning syphilitic diseases in Ghana, including, most notably, the discovery of the yellow fever virus. We visited several high schools that had received our donation, and were deeply touched by the warm welcome extended to us by the government, as well as the group of motivated students at each school, who now had an opportunity to learn computers. In In the Fall of 1994, we invited two high school students to IDCE/KCG in Japan. 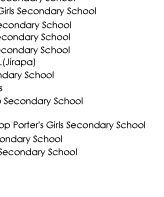 The Ghana Ministry chose two most excellent students from those 17 schools that received the donation. 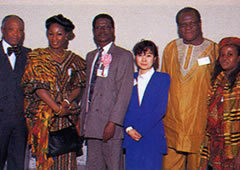 In November, 1994, Yasuko, Yu, and Wataru Hasegawa received awards of honor by the Ministries of Education and of Science & Technology for the IDCE work in initiating computer awareness in Ghanaian schools. 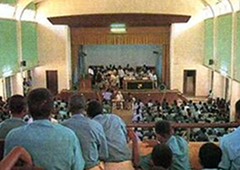 In March, 1996, the National Center for Youth Education was built in Ghana. Upon the request of the Ghan Minister of Education, we donated additional 150 sets of 16-bit and 32-bit computers for 19 high schools and the National Computer Centers. 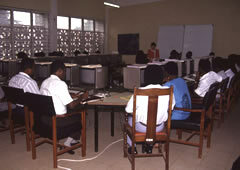 August Held the first seminar in Accra for teachers of the receiving schools. 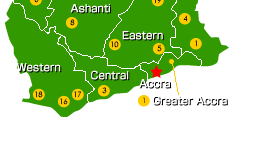 Four KCG teachers, three MIT graduate- student volunteers fly to Accra. Fall The donated computers were settled at high schools and technical schools in 17 areas throughout Ghana. 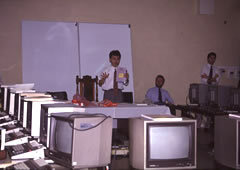 Computer education was started for the very first time in each area by the local teachers who had the training from IDCE. 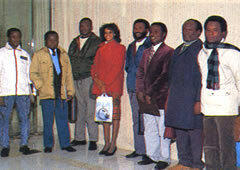 January IDCE officials were invited for the opening ceremony. Received the awards from Ministry of Education and the Director of Ministry of Industrial Science & Technology at the ceremony. November Two excellent students (a boy and a girl) from the receiving schools were selected and invited to KCG for the special seminar. 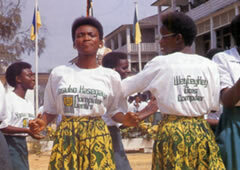 March Established the National Youth Education Center in the capital city Accra. By the request from Minister of Education, donated 150 computers as the second support. 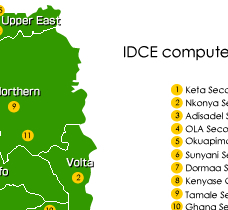 Computers were distributed to 19 high schools throughout Ghana.